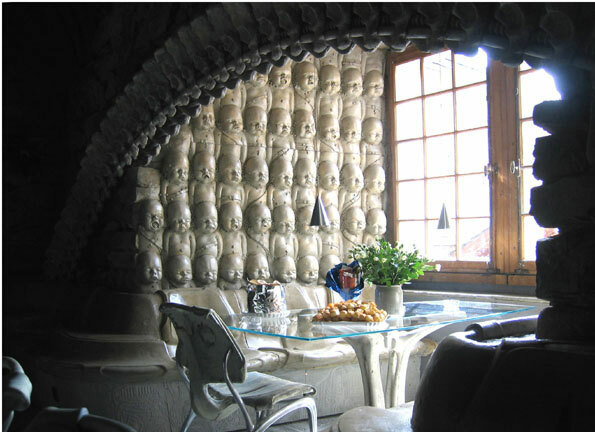 The Giger Bar in Chur or the Devil’s Tavern? The interior of the otherworldly environment that is the H.R. 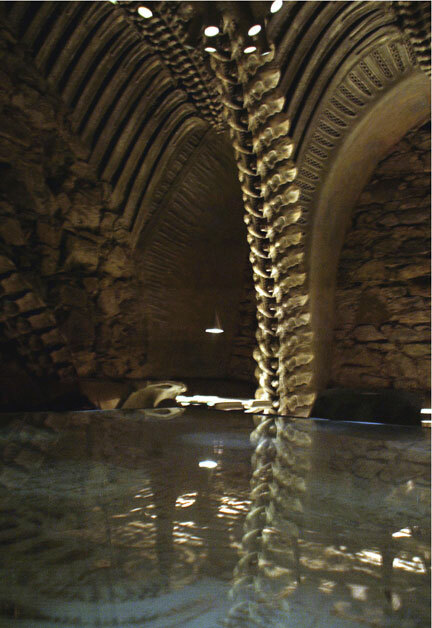 Giger Museum Bar is a cavernous, skeletal structure covered by double arches of vertebrae that crisscross the vaulted ceiling of an ancient castle. The sensation of being in this extraordinary setting recalls the tale of Jonah and the Whale, lending the feel of being literally in the belly of a fossilized, prehistoric beast, or that you have been transported into the remains of a mutated future civilization. The design of this, the artist’s latest bar, is a culmination of architectural inspiration from his other bars in Tokyo and Chur, Switzerland. The bar is open all year-round but only has seats for a scant seventy odd patrons. Serious visitors may want to call ahead first. In the east, Switzerland’s city of Chur in Graubunden, one can have a drink while sitting in the grasp of an alien creature like bar stool at the Giger Bar. 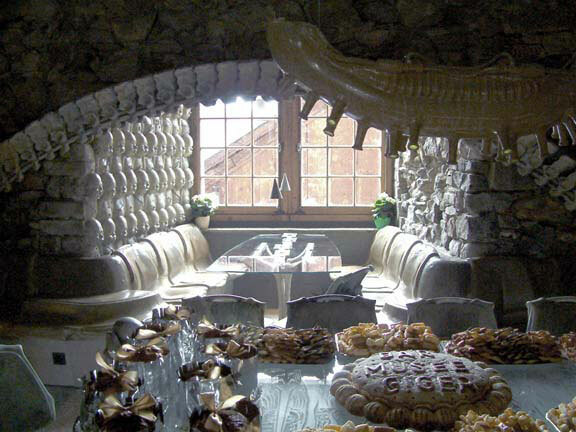 Originally intended for a bar in New York, the unique designs ended up in Giger’s hometown. The Giger Bar in Chur is located a few minutes city bus ride from the old town and rail station in an industrial park the Kalchbühl Center on Commercial Strasse near the offices of Switzerland’s news media company Sudostschweiz and across the street from the curious McDonald’s and Ibis Hotel in a silver pyramid, below. The Giger Bar actually opens in the morning for coffee and internet connection, but gets appropriately creepy at night when the shadows meet the metallic skeleton forms of the unique Giger inspirations, and the bar gets lively with nightlife. 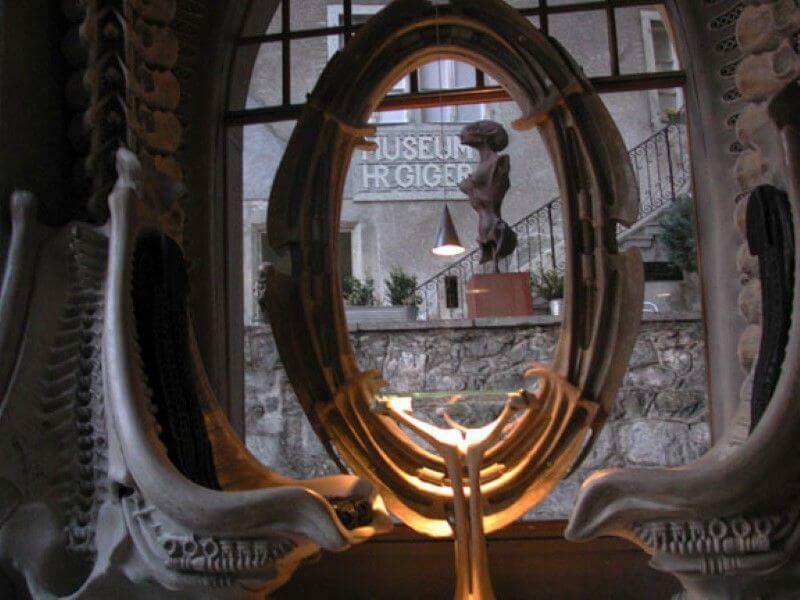 The Giger Bar is just one of several arty bars in Chur (see Design Bars of Chur).